They last stormed Australia and New Zealand two years ago in support of their chart-topping second album, Smoke + Mirrors. In 2017 they smashed radio worldwide with huge singles Thunder, Believer and Whatever It Takes. 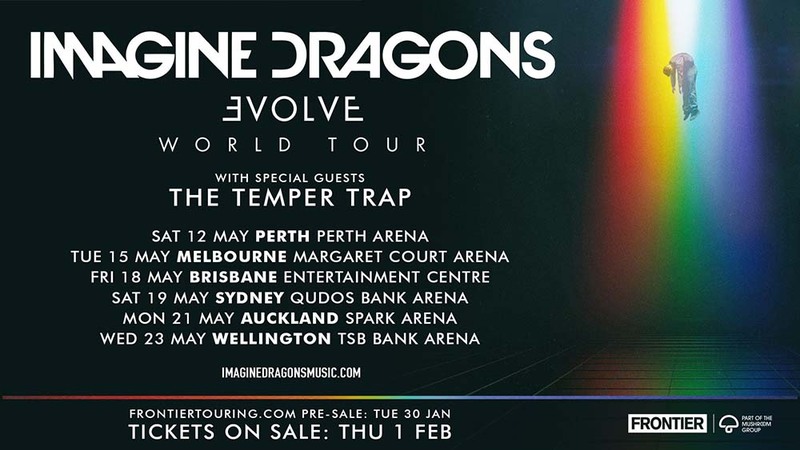 Las Vegas rockers Imagine Dragons will bring their Evolve World Tour to Australia and New Zealand in May 2018 for a blazing six-date run, including their first ever show in Wellington! Formed in 2009, Imagine Dragons - frontman Dan Reynolds, guitarist Wayne Sermon, bassist Ben McKee and drummer Daniel Platzman - have had a massive past 12 months thanks to their third album, Evolve. Released in June 2017, Evolve produced Billboard’s second longest #1 single run in the US chart’s history with Believer, also providing the band’s fourth Top 10 hit in the majestic, beat-heavy Thunder. What’s more, in 2017 Imagine Dragons were ranked the sixth most streamed band on Spotify worldwide! In Australia, Evolve debuted at #4 on the ARIA Album Charts, coming in at #3 in New Zealand. The band collaborated closely with Swedish producers Mattman & Robin (Pink, Taylor Swift, Jason Derulo) and Joel Little (best known for Lorde’s Pure Heroine) on their latest listen; driving the songwriting process was a desire to strip their sound back, culminating into a collection of songs featuring killer guitars, sensitive vocals and above all, unparalleled honesty. Just recently Imagine Dragons conquered the American Music Awards, performing on stage with Khalid for Young, Dumb and Broke and Thunder and taking out the trophy for ‘Favourite Pop/Rock Group’. Frontman Reynolds even used the event to show his support for LGBTQ youth. Currently on the Evolve World Tour, the quartet initially built their grassroots following via an independently released string of EPs, before breaking out globally with multi-platinum debut album Night Visions back in 2012. It would see them embark on their first world tour, which turned into an extensive five-year run. Night Visions marked the first of several career highlights for Imagine Dragons, the album reaching #4 on the ARIA Album Chart and becoming Spotify’s most-streamed album, thanks to smash hits including the diamond-selling Radioactive - which took out ‘Best Rock Performance’ at the 2014 Grammys. Imagine Dragons continued their milestone-laden run with 2015’s largely self-produced sophomore record, Smoke + Mirrors. Filled with engaging hooks, dark lyricism and industrial undertones – see third single Shots - Smoke + Mirrors became their first #1 on the US Billboard 200. This led to a mammoth run of sold-out shows on their second world tour, including Australia and New Zealand in 2015. Joining the band on their arena tour is special guests The Temper Trap, who return after the success of their latest album Thick as Thieves, which debuted at #1 on the ARIA Album Chart and became their second album to take out the top spot. With chart-topping hits such as Thick as Thieves, Lost, Fall Together, Sweet Disposition and Need Your Love, the band return to their home, with singer Dougy Mandagi sounding better than ever. Rumours of new music are circulating – don’t miss The Temper Trap at these epic shows!